Located 90km north west of Kawthaung, 20km from Loughborough Island and south of North Twin Island, this 1km wide granite island resembles the Similan Islands both above and below the water. Large granite boulders below the surface form valleys and gorges, swim-throughs and caverns. Maximum depth is 40m. Visibility ranges from 10-40m. Currents are usually quite mild but can be strong around the full moon time of the month. In the deeper areas the granite boulders are covered in disc anemones and purple soft coral as well as sea fans and feather stars. 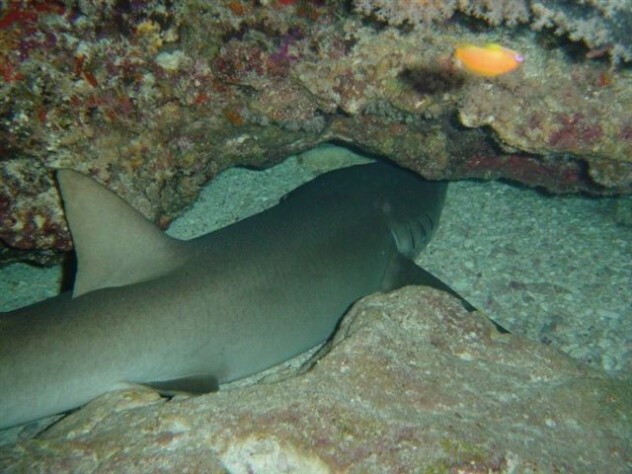 White tip reef sharks and tawny nurse sharks can be seen under rocky ledges. Parrot fish, emperor and blue ringed angelfish, oriental sweetlips and red tooth trigger fish swim around the rocks. Schools of blue lined snapper and fusilier are numerous. In the blue water barracuda and trevally can be seen along with rainbow runners. Shallower parts of the reef are full of anemones and sea fans with a myriad of small reef fish such as anthias and damsel fish. Flutefish and trumpet fish are common, so are wrasse and lionfish. Nudibranchs, sea slugs, cowries and shrimps are some of the smaller species dotted over the rocks. Blue ribbon eels are often seen here in rubble patches. South Twin Island is also a popular spot for night dives and has two sheltered bays on the south side.